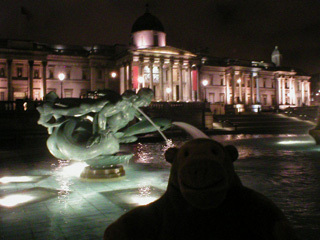 "The National Gallery looks a little pink tonight, you know"
Mr Monkey's humans went out for a meal. 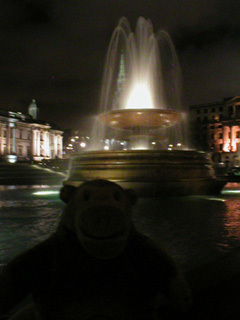 On the way back to the hotel, Mr Monkey led them through Trafalgar Square. He inspected the fountains, which were first finished in 1845, then finished again by Lutyens in 1939, and then finally finished by adding the fishes and merpeople after the war. Mr Monkey was careful to avoid get too close to the dangerous water.